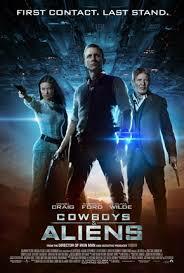 Brief Synopsis – A group of cowboys attempt to stop an alien invasion. My Take on it – This film has a really interesting premise that unfortunately doesn’t work at all. The idea to mesh together these two genres is an interesting one yet it seems too awkward when you try and make sense of it all. It was nice to see Harrison Ford and Daniel Craig working together (c’mon Han Solo/Indiana Jones fighting with James Bond in the old west!) but there is no chemistry what so ever between their characters which detracts from the overall storyline. The special effects helps a bit to make this film a bit fun but overall it all is just one complete mess that probably should have been better thought out before being executed. Bottom Line – Cool premise that doesn’t work at all. Nice to see Craig and Ford working together but things don’t mesh as well as they should. Nice special effects all around help make this a bit fun but the story itself is a complete mess.